Rabbi Efrayim Zalmanovich, of Mazkeret Batya, prohibits common practice after alarming statistics released about diabetes in Israel. Have you thrown candy at a simcha in shul recently? You might be breaking Jewish Law. So says Rabbi Efrayim Zalmanovich, Chief Rabbi of Mazkeret Batya. In a written halahic decision recorded in HaYom- The Israeli Forum for a Healthy Lifestyle, Zalmanovich urges a gradual phasing out of the common practice, which includes throwing candy (usually toffees, in Israel) at a Bar Mitzvah boy, groom, or new father in synagogue in celebration of the life cycle event. 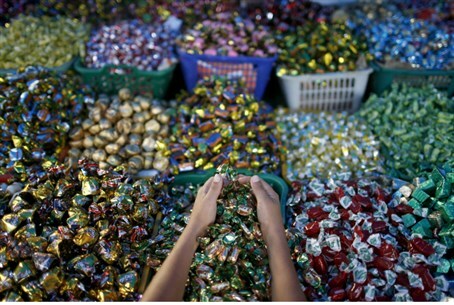 The candy is usually distributed in large quantities to children before throwing, leaving many children to overdose on candy before the Shabbat meal. In order not to upset children - who may not welcome the change, R' Zalmanovich writes - one alternative may be to give them sugar-free candy before the ritual. R' Zalmanovich claims that the change could potentially help prevent more cases of Type 2 Diabetes. He basing his ruling on a Deuteronomy verse, "You shall guard your souls" (2:4) - a verse Judaism explains is a command to look after one's health. His comments were released specifically in November, in honor of World Diabetes Awareness month. In his ruling, R' Zalmanovich writes that modern medicine has cited sugar consumption as a leading cause of diabetes, especially among children, and that diabetes is a dangerous disease which changes the fundamental chemistry of a sufferer's blood. He also praises the practice of throwing snacks on joyous occasions; in Talmudic times, he writes, women used to through healthier candy - e.g. nuts - in honor of a simcha (Tractate Brachot). Today, however, the nuts have been replaced by sugary candy. R' Zalmanovich also released the ruling as a general notice to his congregants, after troubling statistics were released earlier this year that a reported seven Israelis die every day from diabetes - approximately 2,500 people per year. 1400 out of the approximate 1700 amputations each year in Israel are directly related to diabetes. Moreover, roughly 300,000 people per year in Israel are newly diagnosed with the disease - which is advancing here at an alarming rate of about 5% per year.